I’m this close to calling Indianapolis my hometown. I grew up all over the country, and I have no memory of my true hometown, Denver, as I was outta there before I turned two. But my wife grew up in Indianapolis, and most of her family still lives in the area. I met Jennifer in Bloomington at IU 15 years ago (I had ventured from my then-home Atlanta to study music). So for the last 15 years, I’ve returned several times a year to visit family, but also for professional reasons. My connections to Indianapolis have grown steadily over the years; my manager, both record labels I’m working with–Joyful Noise Recordings and Asthmatic Kitty Records, and my lawyer are all based in Indianapolis. My last two releases, Lanterns and Alternate Worlds, feature the voices of two young singers who, serendipitously, grew up in Indianapolis (they are sisters, and make music as Lily & Madeleine). In 2013, I even had the opportunity to perform with the Indianapolis Symphony. All this returning to Indianapolis has shaped my life and career. Though I am a “New Yorker” now (and, I hope, forever), Indianapolis has defined me like no other place. For this reason, it’s always especially sweet to perform in Indy, and performing at CTS for the Spirit & Place Festival was no exception. But more than just an opportunity to return to a familiar place and faces I know, the show was a chance to return to my songs in a new way. Abandoning the electronics and sophisticated studio tools that shape my recordings, I chose to work with just a piano and voices for the show. The piano was my first instrument, and it’s always a bit of a homecoming when I get to spend some time with the instrument. Redeemer Presbyterian Church downtown on Delaware kindly allows me access to their sanctuary at night while I am in town in order to get my practicing in. So in the days leading up to the Spirit & Place event, I spent a few hours each night all alone in their beautiful sanctuary (it’s amazing in the dark at night!). Starting “from scratch” with each song I chose for the show, I built new arrangements with just the piano, and some toys and tools thrown in to modify the sound in various ways. This process of revisiting songs to reinvent them is very familiar to me. In fact, the act returning has been a central theme in my career. Alternate Worlds, for example, is a return, of sorts, to four songs from the previous release, Lanterns. I did this once before, releasing the EP Weapons, which returns to a song of the same name from my first record, and unravels as multiple variations of it. The melody from “Weapons,” in fact, returns again and again in my own new compositions, and even in remixes I do of others’ work. I call it “the ghost melody,” as it returns like a haunting presence at unexpected moments. But the act of returning is a unique type of journeying. When creating, I see it as an opportunity for reinvention, for the re-deployment of an idea or sound. The composer in me loves to return to the core of an idea in order to experience the thrill of the restart, the beauty of the wide horizon lost after the starting point. The return is an end to one kind of journey, but the heart of another kind. To return is to gain the opportunity to experience the journey smarter, with wider eyes and a better understanding. And hopefully, on occasion, it’s an opportunity to appreciate the “home” that makes your journeying possible. 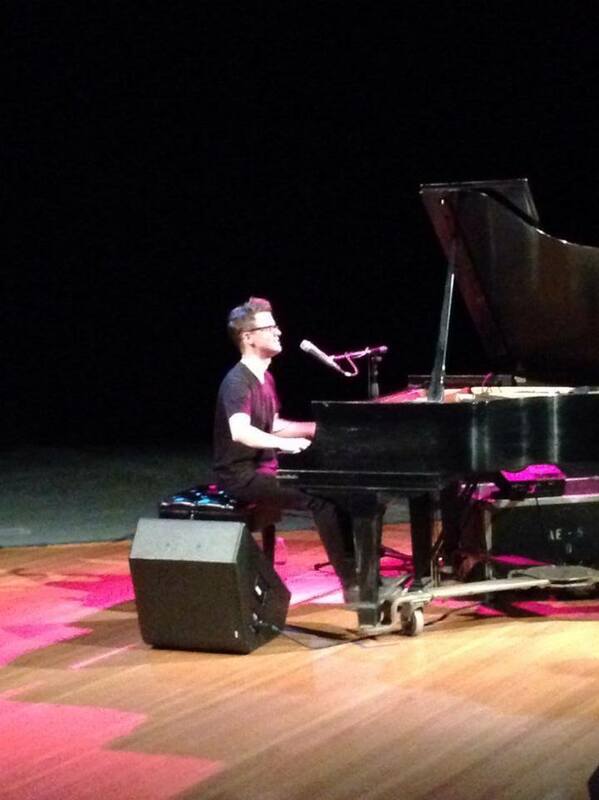 Son Lux performed on April 9 in the Spirit & Place Signature Series event Lanterns Raised: Journeys Through Art along with artists Tony Styxx and Kathryn Armstrong. 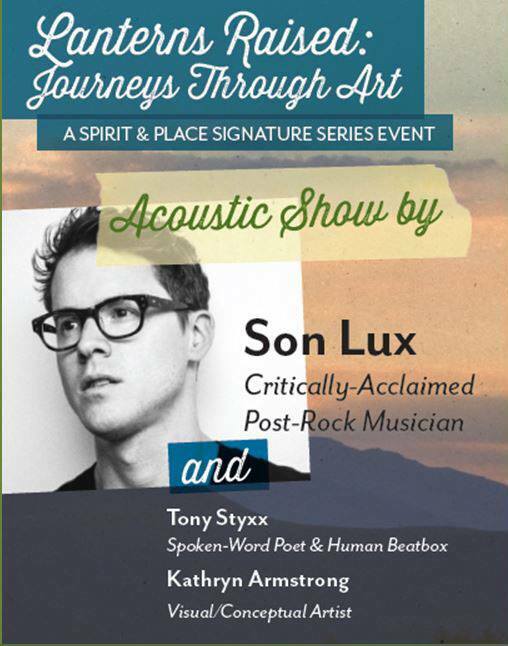 This entry was posted in Journey, Spirit & Place Festival 2014 and tagged Christian Theological Seminary, Lanterns Raised, Son Lux by Spirit & Place. Bookmark the permalink.